Anna’s Amber Zimpfer, left, and Houston’s Addie White struggle for a lose ball during a Shelby County Athletic League on Thursday at Houston. Anna's Mary Landis passes as Houston's Hayden Riesenbeck lunges at Houston Thursday. Anna's Ella Doseck shoots over Houston's Sammie Miller at Houston Thursday. Anna’s Michaela Ambos steals the ball away from Houston’s Megan Maier during a Shelby County Athletic League on Thursday at Houston. 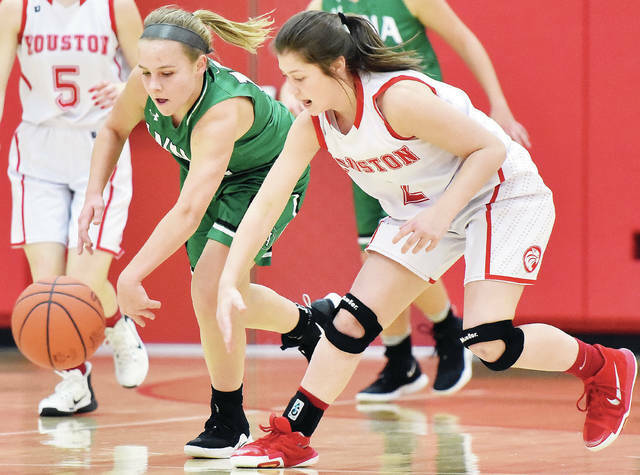 Anna's Ella Doseck drives as Houston's Amber Stangel follows at Houston Thursday. Anna’s Kiplyn Rowland drives past Houston’s Hayden Riesenbeck during a Shelby County Athletic League on Thursday at Houston. 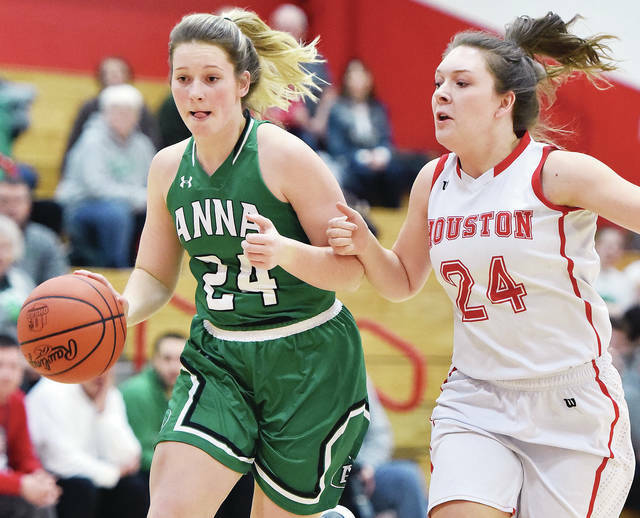 HOUSTON — Anna’s girls basketball team still has seven games left in regular season, but the last third of the season will be a bit like the tournament. That’s exactly by design according to second-year coach Jeff Maurer. 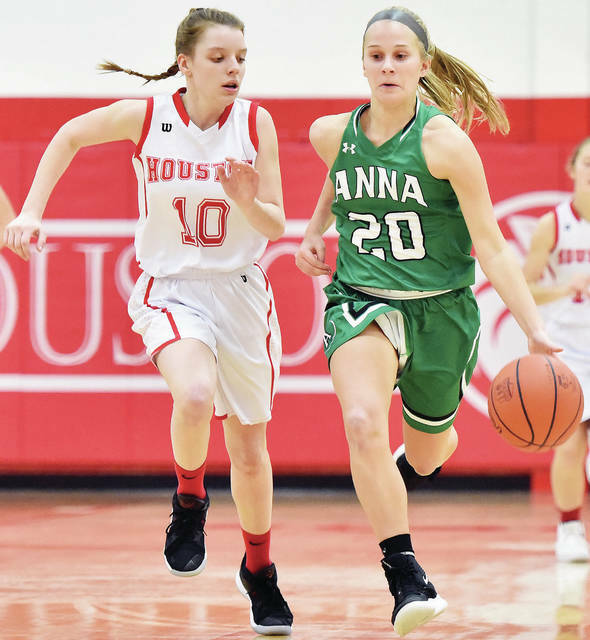 Anna kept itself in a position to compete for the Shelby County Athletic League title on Thursday with a 50-33 victory over Houston. The win was the fourth in a row for the Rockets (13-2, 7-1 SCAL) and the ninth in their last 10 games. 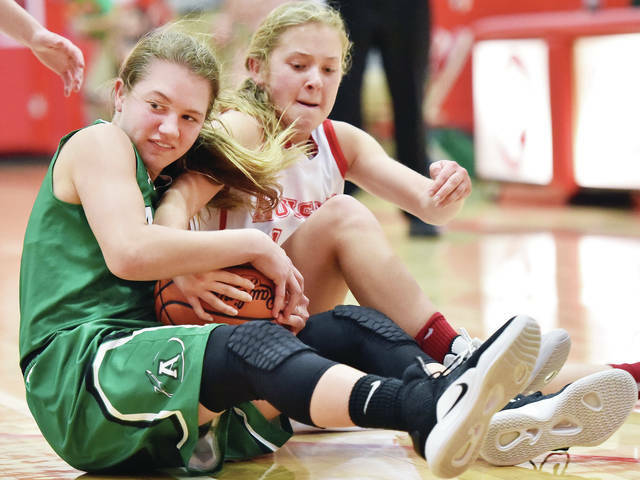 The only loss in that span was a 43-35 defeat against Fort Loramie on Jan. 3. That helped the Rockets on Thursday. Barhorst, a junior center, led the Rockets with 13 points and opened up shots on the perimeter — including for Beah Kuck, who hit four 3-pointers in the first half to help the team take a 30-17 halftime lead. A hard slate to end the season starts on Saturday for the Rockets when they travel to defending Division IV state champion Minster. Among other tough games over the next two weeks is a home contest against Waynesville (11-4), a road game against Middletown Madison (13-1) and conference games against Russia and Fort Loramie. The loss was the second straight for Houston and the third in the last five games. The Wildcats (7-11, 4-5) lost to Fort Loramie by 51 points on Monday. It was the final home game of the season for Houston, and the team honored its seniors before the game. The Wildcats have four road games left to close out regular-season play, which starts next Tuesday at Botkins. “We’re still right in the mid-pack in the conference and still have chance to finish third if we get some good wins together as we go down the stretch,” Houston coach Brad Allen said. “Obviously the results aren’t what we wanted, especially having our four seniors play their last home game. But they work hard; their effort was there. The Rockets then scored the first nine points of the third quarter to push their lead over 20 points. Kuck finished with 12 points and Ella Doseck scored 10. 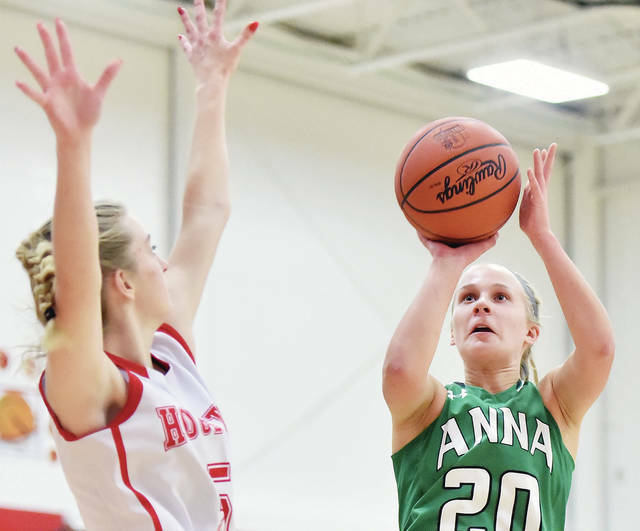 The teams traded points early but Anna pulled ahead before the end of the first quarter by finishing on a 7-0 run. Barhorst made a basket with 3:19 left, then Kuck made a 3-pointer with 1:55 left. Doseck stole the ensuing inbounds pass and laid a shot off the glass to put the Rockets up 14-7. “We just had that breakdown there at the end of the first quarter where we turned the ball over a couple of times and they capitalized on it and got some points,” Allen said. Jess Monnier hit a basket with 6:21 left in the second to bring Houston within 19-12, but Doseck and Kuck made 3s over the next 90 seconds to boost Anna’s lead to 10 points. Mary Landis scored after a steal with 1:15 left and Lilly Toller scored with five seconds left to boost the Rockets’ halftime lead to 30-17. Monnier led the Wildcats with 10 points. Anna’s Mary Landis passes as Houston’s Hayden Riesenbeck lunges at Houston Thursday. Anna’s Ella Doseck shoots over Houston’s Sammie Miller at Houston Thursday. 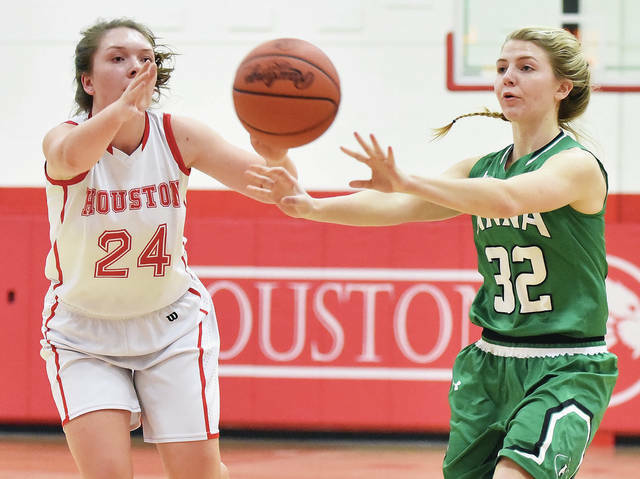 Anna’s Ella Doseck drives as Houston’s Amber Stangel follows at Houston Thursday. This entry was tagged Anna, basketball, Ella Doseck, girls, girls basketball, high school, hoops, Houston, Jeff Maurer, Lauren Barhorst, Rockets, SCAL, Shelby County Athletic League, Wildcats. Bookmark the permalink.